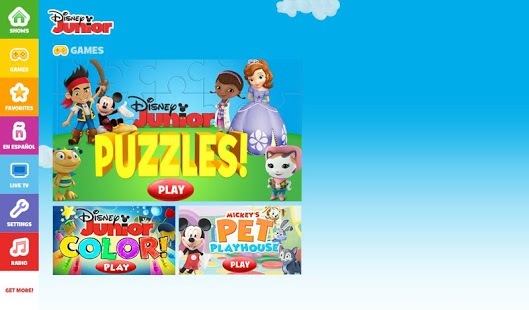 WATCH Disney Junior is a free app that allows kids to watch full episodes, clips and games of their favorite Disney Junior shows on a tablet, phone or computer! AT&T U-verse, BEK TV, Charter, Comcast XFINITY, Cox, DISH, Midcontinent Communications, Google Fiber, Optimum and Verizon FiOS are currently the only TV providers offering access to LIVE video and the newest full episodes. Add Chromecast feature! Great app, just needs the ability to cast to a TV.